Joyful Christmas Greetings Cottage Friends! This sweet "Joy" card pinned to the little magnetized board above my desk perfectly illustrates my mood as Dennis and I celebrate our first Christmas in our cottage. Yes, thank you Lord for the joy we have in You first! I've had this nativity scene for years and years. It doesn't feel like Christmas in our home until I have it set up. Under the nativity is something that is not related to Christmas, but I can't bring myself to get rid of it just yet. The little white pumpkins in the rustic basket. I'm such a sucker for these. I'm sure this is some kind of seasonal decorating faux pas that could get me named Worst Home and Garden Blogger of 2015, but hey -- I'm okay with that. The pumpkins stay until they start to get mushy. 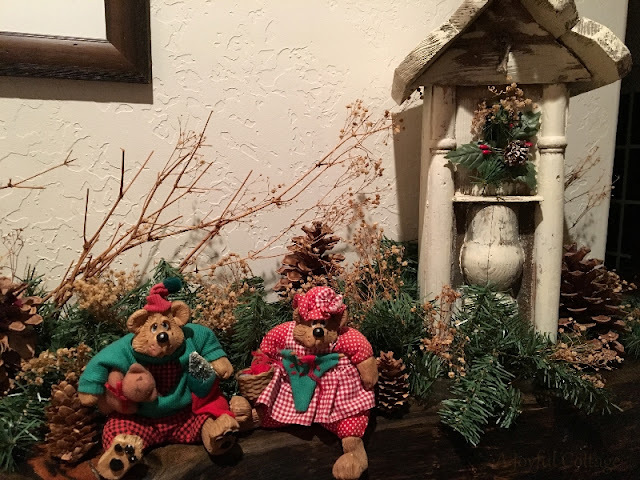 When I rummaged through our small box of decorations I found Mr. & Mrs. Christmas Bear, a whimsical gift from one of our kids last year. Their country attire gave me an idea for the mantel, so I started shopping our cottage. I thought my shabby Victorian birdhouse would work well with the bears. Then there was the galvanized lantern Dennis bought recently at a yard sale, and the hand-painted holly plate I found at a thrift store last year. I put it all together and voilà. . . 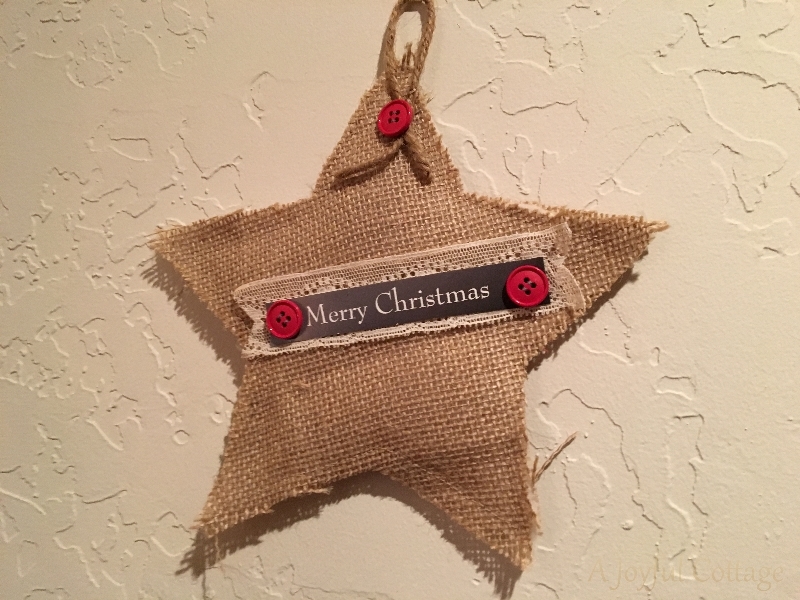 The only thing "new" here is the star, which I made with materials I had on hand. 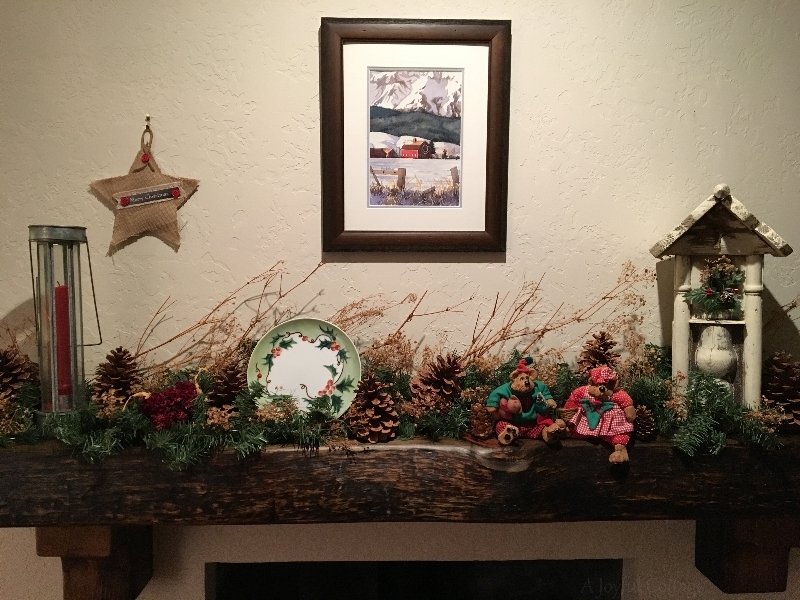 I had fun creating the Christmas mantel. Dennis loves the country cottage theme, and I like it when my husband's happy. Now here's something that really made me happy. On Tuesday I received a gift in the mail from my blogging friend AnnMarie of Musings of a Vintage Junkie. 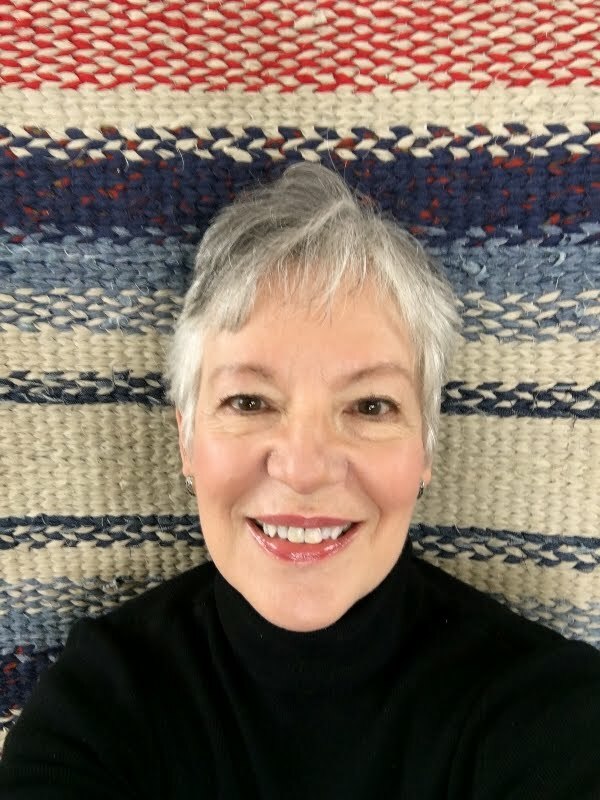 You probably know her because AnnMarie is super friendly and nice and has a great blog. But just in case you haven't met her, hop over to her blog and get to know her. She's wonderful. 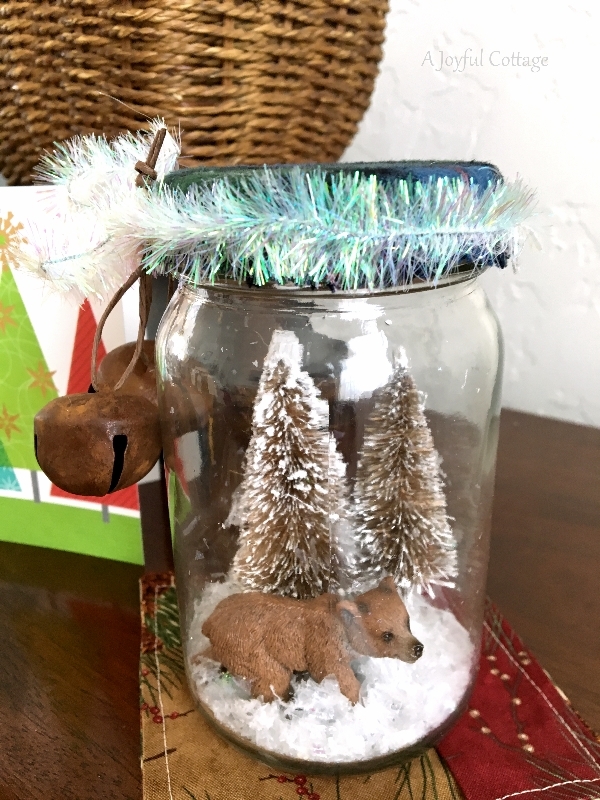 Anyway, she made this snow globe for me. I love it! The snow globe deserves something pretty to sit on, so I whipped up a little patchwork rug for it. So that was fun, too. Because, you know, I like to make things. Speaking of making things, this came in the mail this week, too. It's a twining loom for making rag rugs. 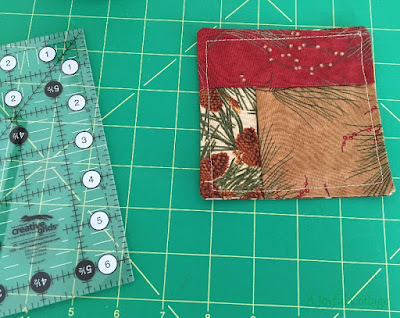 I can hardly wait to get started and, yes, I'll share the process with you. You know I will. But back to Christmas decorating (sorry). We bought a Christmas cactus and I used green plaid fabric I had on hand to cover the pot. 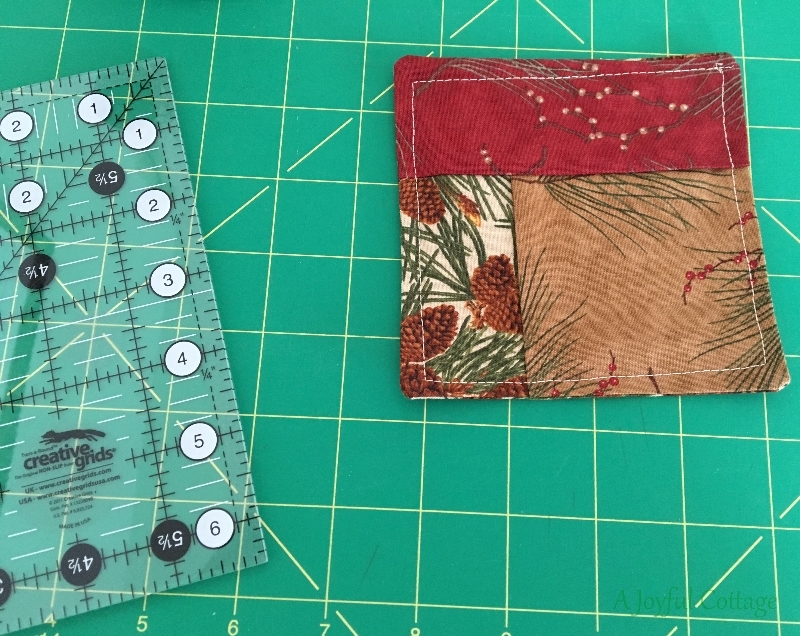 I like the tattered edges and messy look of the fabric, so no hemming and no ironing. I just wrapped it and tied it with twine. Done and done. 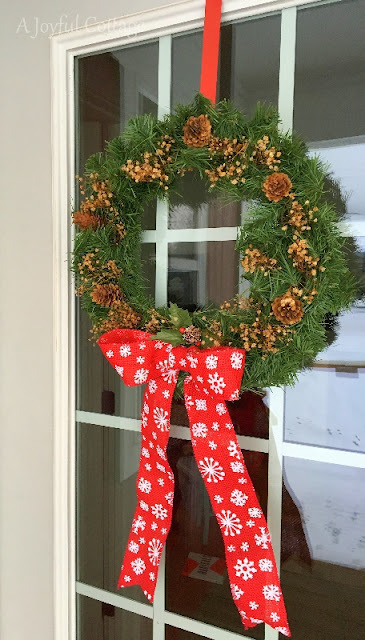 Here's an amusing story about the front door wreath I decorated with natural elements leftover from my mantel. . . Okay, before I go I promised to tell you more about the ranch scene Dennis painted. This is Rocking OK ranch in the Wallowa Valley -- Northeast Oregon. Not far from where we live. It's the most photographed ranch in Oregon. A little more trivia. . .
That's Walter Brennan (1894-1974) three time Academy Award winner for Best Supporting Actor (1936, 1938, 1940). He owned the Rocking OK ranch, where he raised his family far from Hollywood's influence. His son Mike owns the ranch now. The Brennans have done a lot for the community and are highly regarded in these parts. I've got a few more things to tackle before I can call Christmas Decorating 2015 complete. Such as a Christmas tree. Whaddya think? Polka dot ornaments? Your hubby's watercolor is amazing, Nancy! It looks perfect in that spot, and I love that it has a special story, too. Your cottage is looking very festive! Thank you, Julie. I appreciate your compliment of Dennis' watercolor. He's very talented, and I love to share his art. Is your frame a Libby Lu Lu Loom? I have a runner nearly finished on a similar frame. Beautiful Nancy. Love the oil painting too. The new cottage is looking so pretty and festive for the holidays. Nancy---the thing that I love the most about your holiday decorations is that you were able to do so much with the abundance of natural elements that you cleverly arranged, including the wee little pumpkins, I still have two that I'm hanging on to. Maybe I'll wrap a few rounds of berries around them and call it Christmas!! I love a country Christmas. Sometimes I go with a little bling here and there for the sparkle but otherwise I'm inspired by coziness and a lot of nature. Your bears are so cute. I love your decorating and it is what pleases you that matters. I still put out the popcyle manger that Hubby made for our first christmas. I remember when our Daughter said we should buy a new one and I said no way, your Father made that for me and I will always put it out. 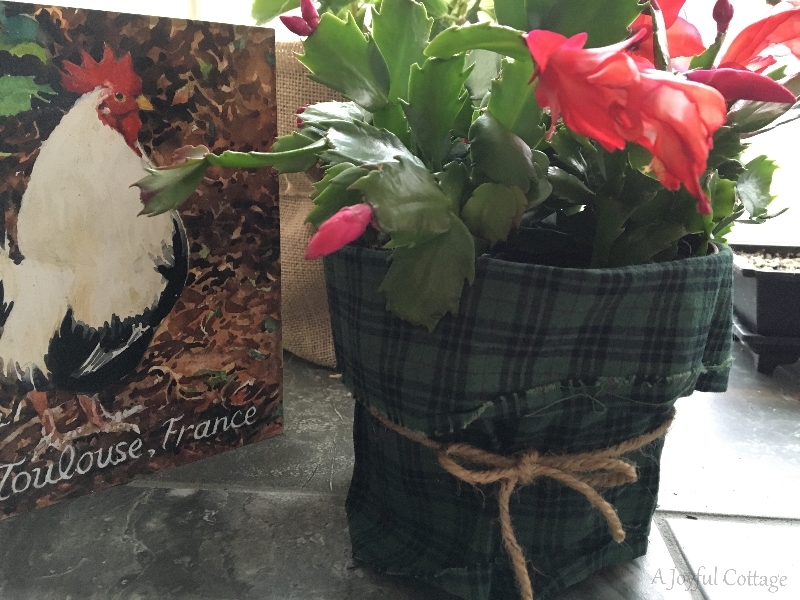 I couldn't wait to see your cottage decorated for Christmas - and I wasn't disappointed! Your mantel is just right. And I LOVE your nativity set. I could spend a long time studying every detail of it and remembering the story it represents. You are SO fortunate to have your own resident artist. The painting over the mantel is wonderful and I loved hearing the story of the ranch. I didn't know Walter Brennan lived in Oregon. I haven't begun to decorate for the holidays. My sweetheart has to bring the decorations down from the attic. Oh, as I typed that last sentence he started his trek up and down the stairs! You've inspired me again, dear friend. Your home looks so warm and welcoming, Nancy. I love all the little details. 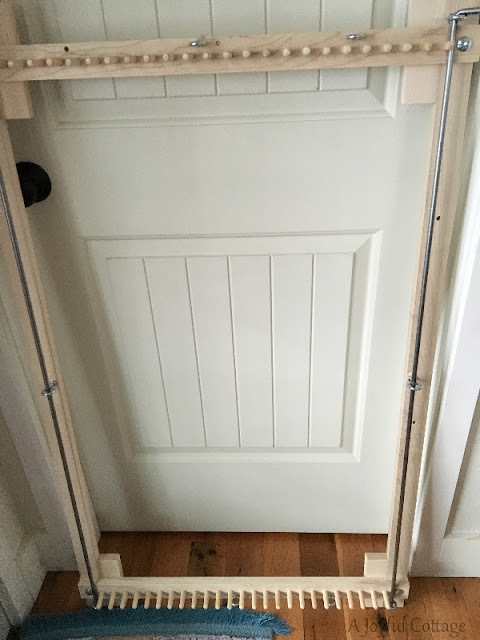 What a happy and creative post. Filled with lovely ideas and things to look at. What a neat bit of information about that ranch and the owners. Walter Brennan is a familiar face. What a wonderful place to raise a family away from the hustle and bustle of Hollywood. Your husband's painting is very nice. Love your mantle. 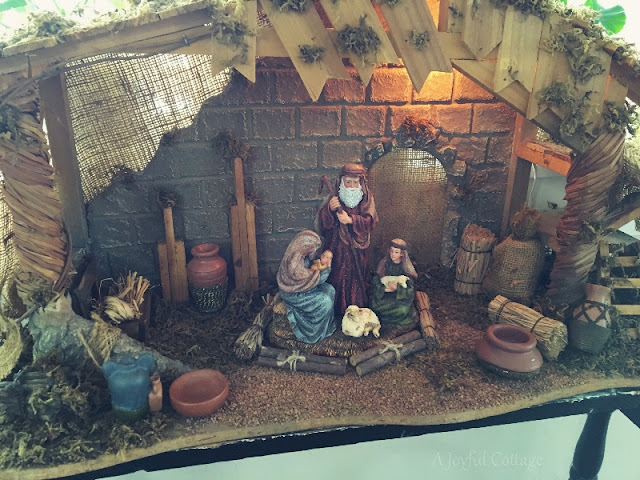 Love all of the details in your nativity set too. Looking forward to seeing your tree. NANCY! Merry Christmas dear one! Isn't it fun to decorate? It seems to me that as I get older, I'm actually enjoying the holidays MORE because I see the entire winter holiday as a time to CREATE wonder and magic, like the kind we dreamed of as children. Last weekend I spent time (five days off for Thanksgiving) and enjoyed fixing up the house. It felt so good, and like you, I loved my pumpkins. But mine got mushy just in time to make a shift from pumpkins and a Cinderella carriage lamp to a table top platinum tree on my front room table, and then a real fir tree for my great room! All is sparkling. Wishing you fun and JOY as you dream and create! 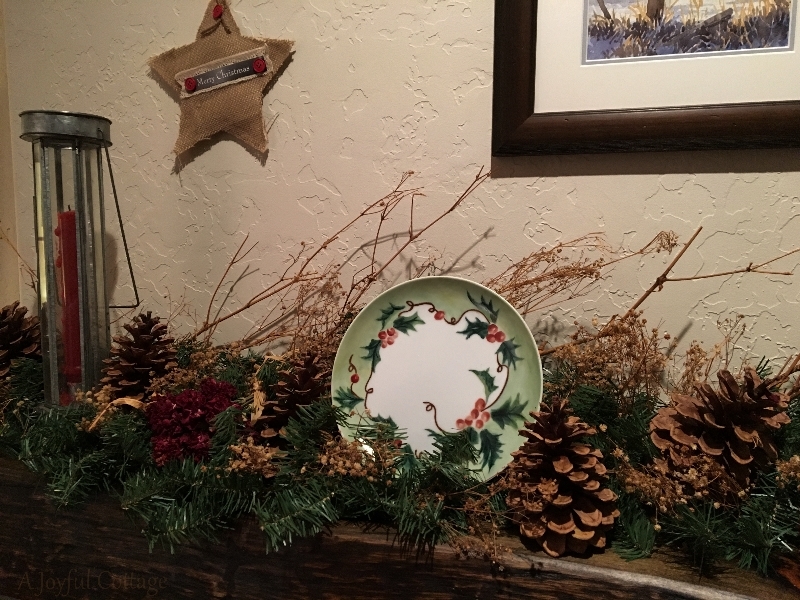 I just love your Christmas mantel with all the natural elements! Your husbands beautiful painting adds the perfect touch. So cozy! Thank you for your very kind words too....I think you are wonderful and easy and fun to talk to also, and besides I love your blog! I love that you could just instantly make a little patchwork rug for the jar....so cute and it goes perfectly! So funny about the pumpkins....I have 4 huge funky ones, and a bunch of gourds and decorative pumpkins that are in perfect condition. I don't want to throw them away! They are outside on my front porch, which I haven't decorated for Christmas yet, so they are staying! How could I lose all I wrote . . .
Oh my . 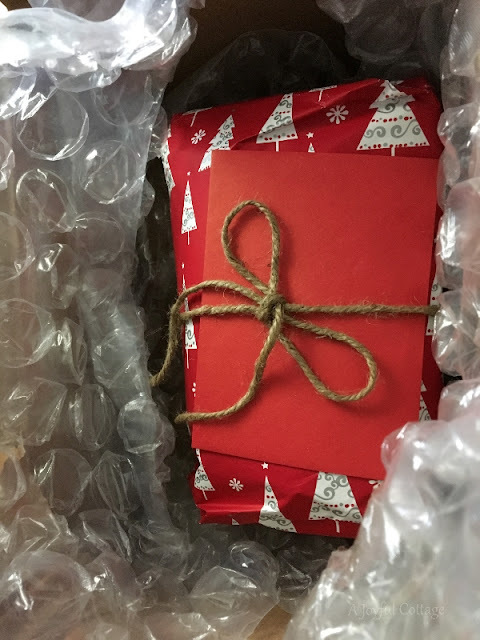 . . and such a delightful post . . . . The star . . . The crowning jewel . 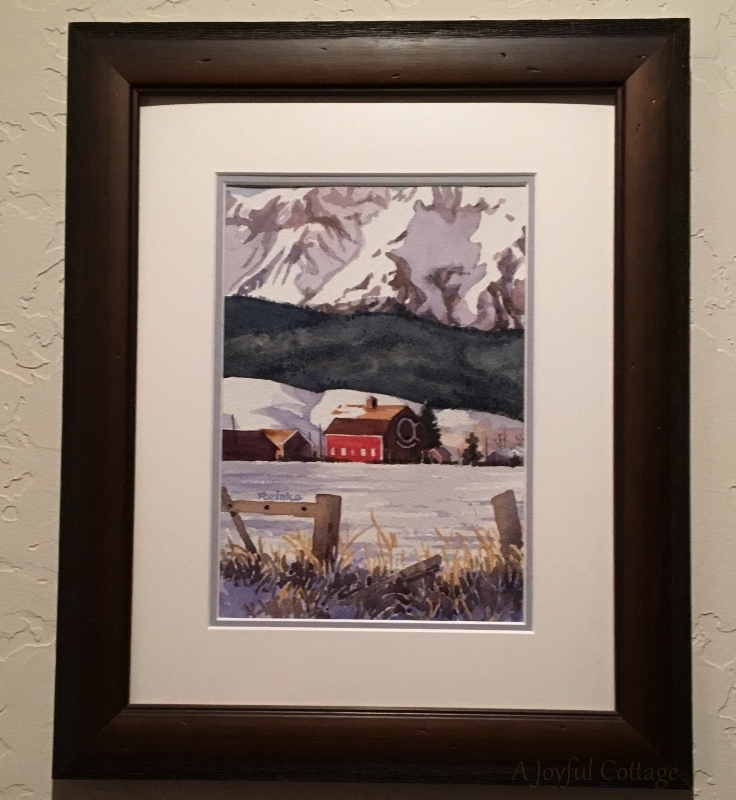 . .
Dennis' painting and the story . . .
A wreath with polka dots . . .
Green plaid flannel wrap . . .
A cottage that tells its stories . . . The nativity scene... the mantle... alll perfectly cottage cozy!! and WOW... I loved Walter Brennan.... do you remember him in the televison series "The Real McCoys" ??? Very talented man.... What a beautiful ranch pic!! Yes, I do remember The Real McCoys. I also remember him in some pretty serious roles. Brennan was a very talented actor who could play comedy as well as he played drama. I see the magic in your cottage this 1st Christmas. A heartfelt celebration in the comfort and beauty you and Dennis have created in your amazing enchanting cottage. Love his painting. 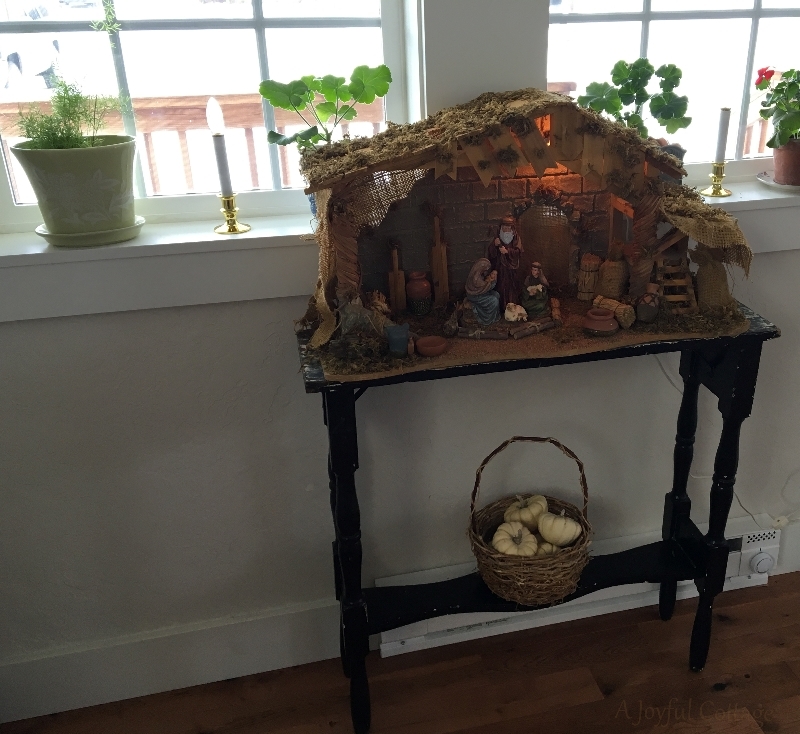 Your Nativity scene is rustic and beautiful, my Mom had one that held rustic elegance and I need to ask my brother if perhaps it's in storage to grace my home with it. You have inspired the emotional need for having my Moms which is over 50 years old and I thank you Nancy for this. Your son's ranch purchase is magical, isn't it? I hope you will show photos of it soon so we all can celebrate a rebirth of a place where a admired star called home. Must have great energy there. Oh those adorable bears, sweet whimsical gifting from your children. Love your star they have special meaning to me and I ask how cute is that snowglobe, blogger friends truly grace our lives. Have fun crafting your rag rugs, such an endearing craft. "He owned the Rocking OK ranch, where he raised his family far from Hollywood's influence." I knew that your place would look lovely for the holidays and I was right! :) Charming and by the way, I just tossed my little white pumpkins into the yard today. Couldn't bear to part with them either! How cozy your cottage is looking as you get ready for Christmas, Nancy! 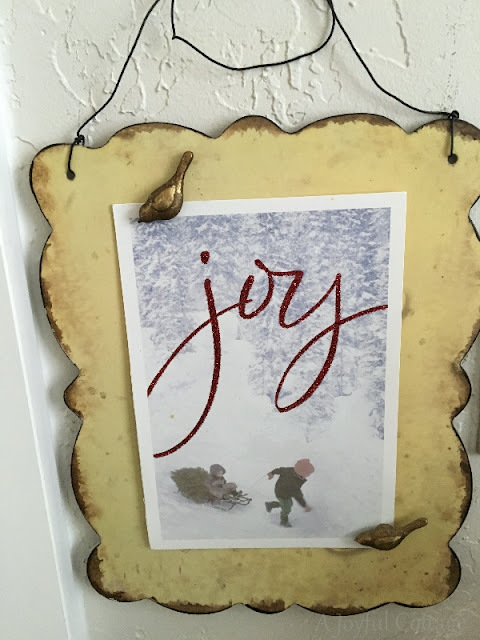 What a joy to be celebrating this year in your sweet, special home! It all looks so beautiful. I love shopping my house to decorate. I've created a stash of reusable things that I just change out for the seasons...lanterns, vases, platters, ect. It's so nice to just use seasonal things to decorate the same basic items & free up a lot of clutter. 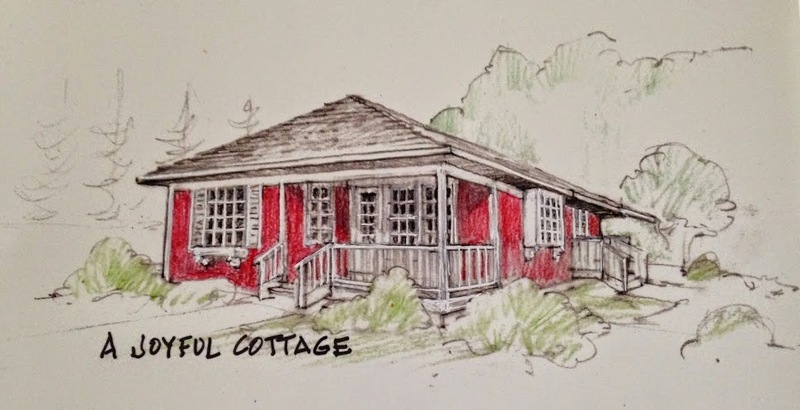 Your cottage looks amazing. Love all the natural elements you used, especially your wreath.